77 percent is the chance that a child born in the upper-income quartile will complete college by age 24. 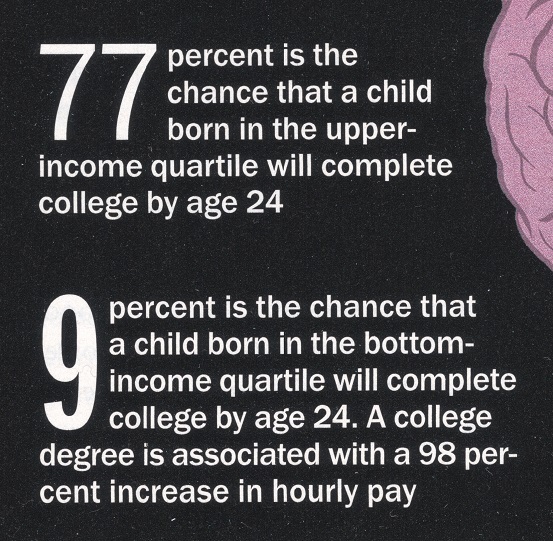 9 percent is the chance that a child born in the bottom-income quartile will complete college by age 24. Scarcity of female geniuses explained? In the current issue of “Scientific American Mind” (Volume 23, Number 5, November/December 2012, page 63) Sandra Upson and Lauren F. Friedman consider the question of why women have been under-represented at the top of their fields. Although the article is by no means revelatory to experts in the area of gender studies, it may serve as an accessible introduction to the subject. The authors begin by pointing out the scarcity of female geniuses in the popular consciousness. Readers are reminded that for most of history cultural imperatives reinforced by false assumptions regarding women’s abilities made it virtually impossible for them to develop their talents and pursue eminence. Then the authors quote research proving that “in aggregate, women and men perform about the same on intelligence tests.” While acknowledging that gender discrimination still accounts for some of the differences in creative output of men and women, the authors cite studies suggesting that the gap results from “preferences relating to family and work-life balance.” They conclude by calling for measures designed to alleviate legitimate concerns about conflicting priorities such as a career in academia, caregiving and household responsibilities. It might be tempting to dismiss the article as lacking the depth and breadth the topic deserves. It could be argued that the authors neglect or barely touch upon a wide range of factors contributing to gender disparities in scientific and professional realms. In addition, a number of valid criticisms could be made with regard to the article’s narrow focus and its frame of reference. The fact remains, however, that it was written with a general audience in mind and published in a popular science magazine. Viewed from this perspective, it should be appreciated as a small step towards raising public awareness about the issues discussed. Click here to read the article (available for non-commercial educational purposes only).